Earlier this year in January, I was asked to share a brief 5-minute testimony at our church women’s retreat. I’m finally getting around to posting about it and it only took me six months! In the months following the retreat, we find ourselves still waiting and trusting in God’s timing (it’s been challenging! ), but we continue to lean on Him with hope and praise. This was my introduction, before I went up to speak – I live in San Lorenzo with my husband Jason and am a stay-at-home mom to our kids Micah (8) and Rebekah (4). We’ve been attending Creekside [Community Church] for almost 5 years. I am a coffee and milk tea addict, [who] loves discovering new places to eat and fun things to do with my family, and am passionate about missions and service. And here’s what I shared with the group – “So a little background about myself. Before coming to Creekside, my husband and I attended a church in San Francisco, where we were active members since we were Junior Highers, so for about 20-25 years. Coming from a church where you know almost everyone and all the ins and outs of what’s going on, to a church where you only know maybe only 1-2 families…well, that was a BIG change. We stayed pretty low key at Creekside for awhile. It took us about two years to even sign up for name tags and for some reason, it was a big step and a big deal for us! Since then, we’ve been serving in little ways that we can and have been blessed to be a part of Tim and Jenny Sloat’s community group for the past couple of years. Tonight, I’ll be sharing about what God has been doing in my life more recently and how I have been responding. September 14, 2015 is a day that I will not forget for a long time. The morning started out fine. Jason went to work like normal, and we were expecting to hear from our real estate broker about signing new loan documents for our house. Which was a huge relief!…because back in April, we found out that 1of our 2 loans was not a 30 year fixed loan like we thought it was, but actually a 10 year loan that was due on October 1st. We had to either come up with ~$48K to pay back that loan or try to refinance, which we had NO luck in doing before. But after a lot of research, days and nights of worrying and stress, lots and lots of prayer and a referral from a friend that led us to our broker…God provided a way out for us. We were days away from signing our new papers. Then that Monday afternoon comes around and I get a call from Jason. He tells me that he got laid off from his job, a company that he had been with for almost 10 years. This couldn’t have happened at a better time, right? We already had accumulated all this debt, the Oct.1st deadline was coming up, we had very very little savings…what else can go wrong? I’ll come back to this in a bit. Back to our refinance issue. I’m jumping back and forth, because it all ties in together. Praise God that Jason’s former employees agreed to keep him on the payroll until the end of September, which meant that Jason was technically still employed and we were able to sign the new loan documents that week. It was a such a heavy burden that was lifted. After sharing about my hopes for our community group with Jenny and Ashley and 5 days after Jason’s layoff…my mom gets into a really bad accident that left her with a subdural hematoma (which is some bleeding outside of the brain), a slightly collapsed lung, a fracture collarbone and fractured ribs. My then 69 year old mom had fallen off the ladder in their backyard and I know that God watching out for her, because she was not knocked unconscious. Somehow, she was able to crawl closer to the back door and started screaming for my Dad, who could not hear her screams, because he is hard of hearing. Thankfully, their neighbor, who isn’t always around but happened to be around that day, heard her screaming. He climbed over the fence and called 911. If he hadn’t been there or if my mom was knocked unconscious, who knows what could’ve happened. My mom spent the next 6 nights at Highland Hospital in Oakland, two of those nights were in the ICU. Btw, my mom is doing well and has recovered from her injuries. Needless to say, that was a stressful time. But it was God’s perfect timing, because being unemployed allowed Jason to be at home full-time with the kids and I could focus on taking care of my parents. We could have managed even if he was still working…it just would’ve been more stressful and inconvenient. During this crazy time, instead of focusing on all the bad stuff, God was teaching me to focus on all the good stuff. Instead of focusing on Jason’s unemployment, God was giving us more family time together. We also began to experience those deeper connections with our community group that I had been praying for. I just didn’t expect us to be on the receiving end of things, because I like to be the giver and the encourager and the helper. We are always willing to help, but we don’t like asking for it, right? An example of how we were on the receiving end. The Men’s Retreat was coming up and Jason had decided, even before he lost his job, that he wasn’t going to attend for other financial reasons. But the guys from our small group decided that they wanted to send Jason to the retreat and gift him with a weekend away, so he could rest and reflect and fellowship. At first, Jason wasn’t sure if he should take the offer, but God reminded us that our friends really wanted to bless him with this. If Jason and I find delight in blessing others, we should allow our friends to experience that same joy. “Every good and perfect gift is from God.” It’s not about who gives and who receives…it’s about God, the one whom all gifts come from. So Jason went to the retreat, had a good time and was really blessed by it. Since then, family and friends have been blessing us in different ways…dropping off meals, giving us gift cards for gas and groceries. We have no other income other than the money coming from unemployment, but we’re focusing on trusting in God and making it work. 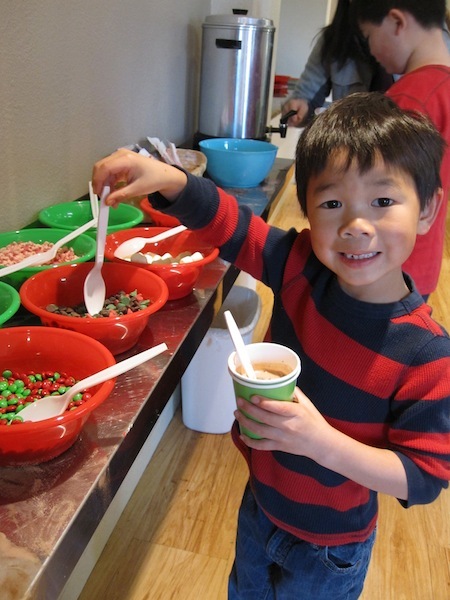 One of the fun things that our church does year-round is host parties for the kids in the community. 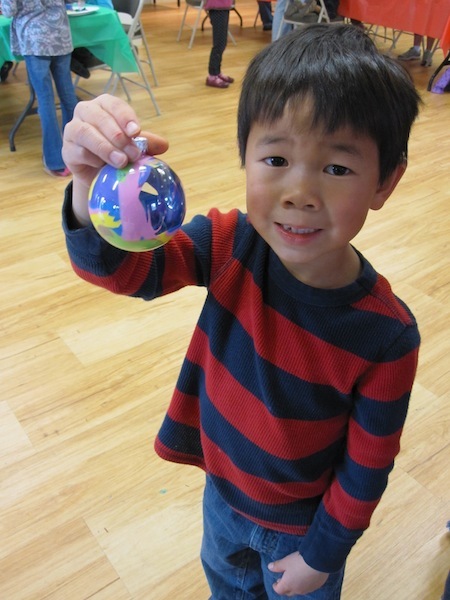 Back in December, I took Micah to the ornament making party. 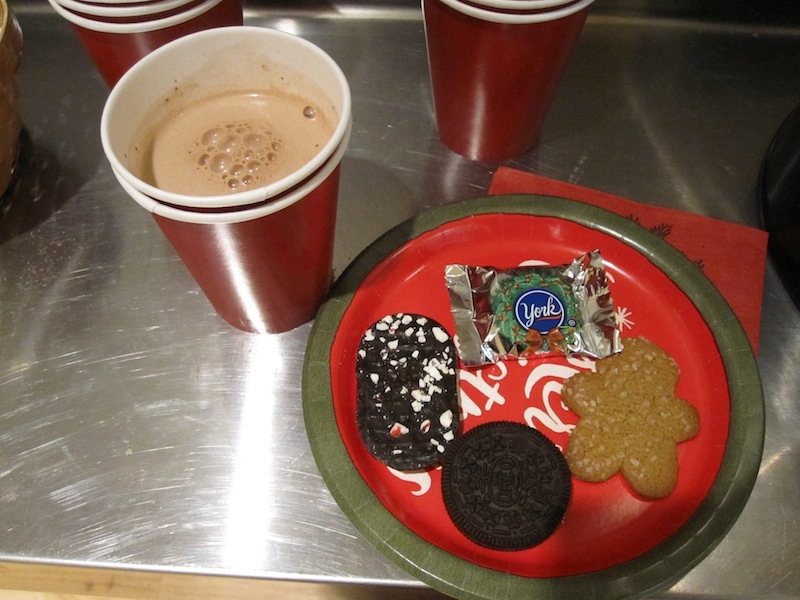 There were six projects for the kids to make, a hot cocoa bar and yummy treats for everyone. Our church also hosted a Ladies Ornament Making Night and I attended that as well. It was fun to get away for a couple of hours, make crafts and fellowship with other women from church. 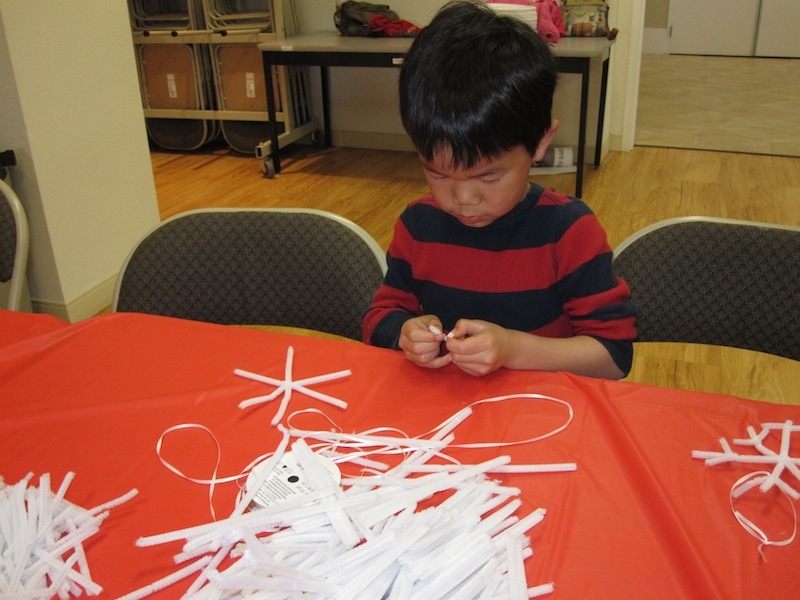 Here is Micah making a snowflake out of white pipe cleaners. 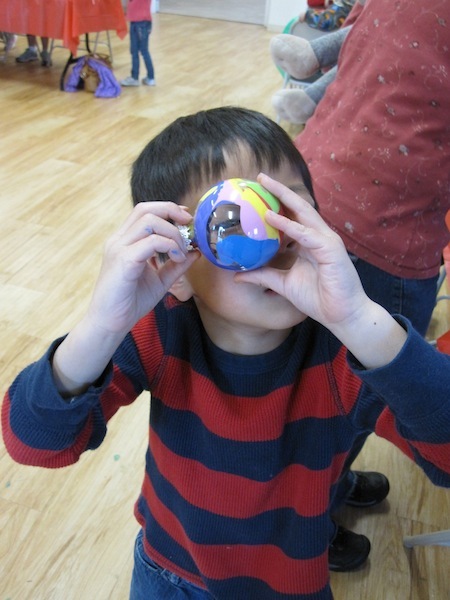 Filling a plastic ornament ball with different colors of paint. 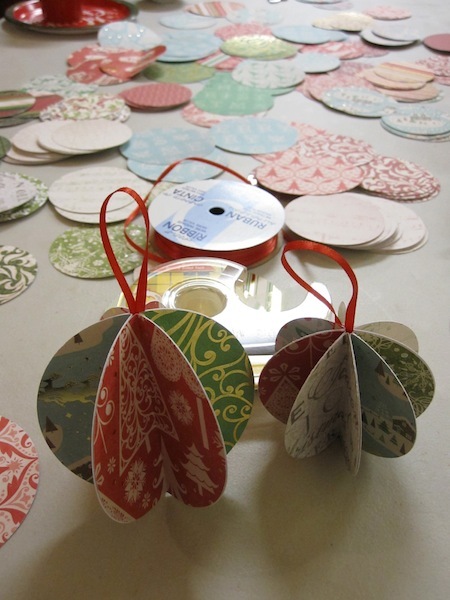 Another fun Christmas decoration…festive garland! This was made out of string and round color-coding labels. Here are a couple of the ornaments that I made at the Ladies Night Out. 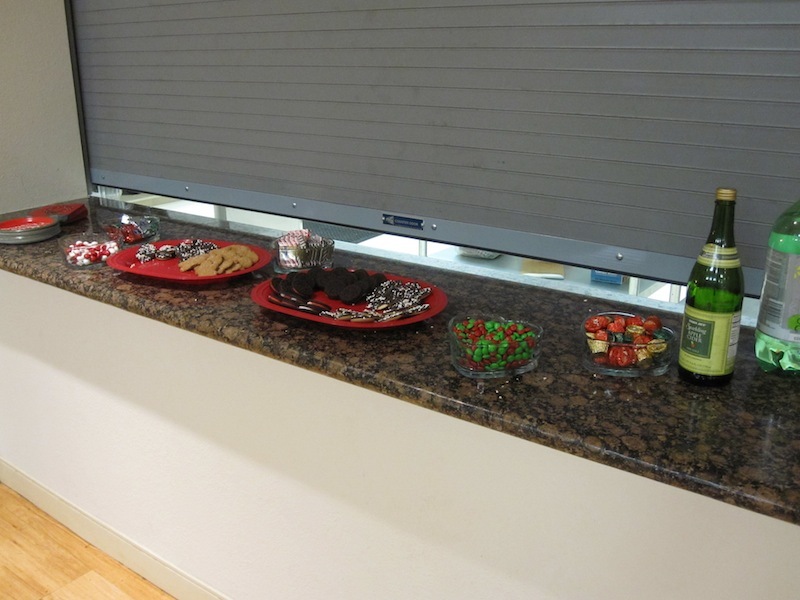 We had our share of treats too! 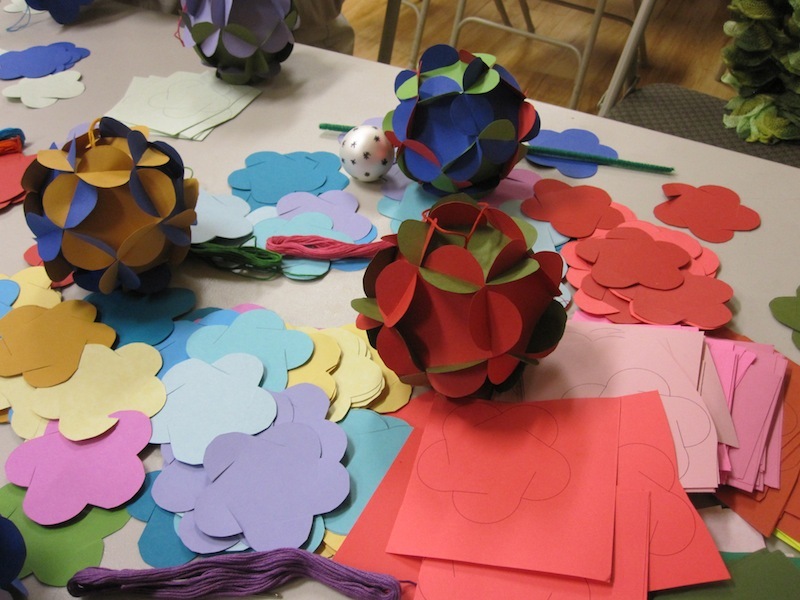 I’m looking forward to our next community party…Valentine Making Party! Thank you, FlyBy Promotions, for providing me with this list as an extra resource to go along with my review of Rufus and Ryan Go To Church. 1. 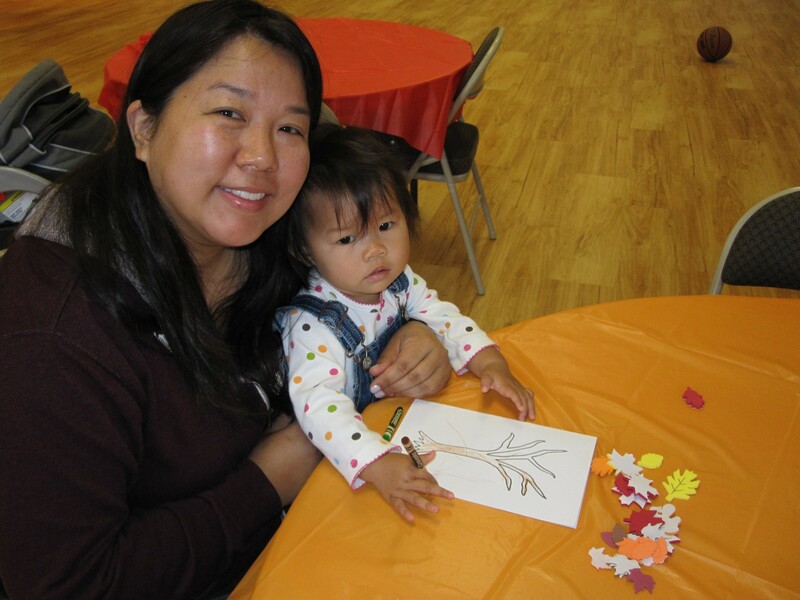 Attend a child-friendly church. A church that invites children to attend worship, that has a children’s time during worship or a service in which children are included, will not mind the noise and commotion that comes with having young children in worship. 2. Bring your child to church on a day other than Sunday morning. Call the church office and make an appointment with a pastor, Christian education director, or church school teacher. Go on a tour of the church facility, and locate the Sunday school rooms and bathrooms as well as the sanctuary. Let your child explore the sanctuary, see how it feels to sit in the pew, and leaf through the Bibles and hymnbooks. Look behind the pulpit, Communion table, and baptismal font, and explain the use of these. 3. Take home a worship bulletin and go through the service at home. Show your child that there are times to sit, to stand (and in some places, to kneel), to sing, to pray, and to listen. If the Lord’s Prayer is used, write down the words and let your child practice at home. Prepare offering envelopes and let your child put money in the envelope, and explain why the offering is important. 4. Play “Let’s go to church” at home. Practicing the worship service at home will help your child feel more comfortable with what happens in worship. 5. Read the Bible and pray at home. Purchase an age-appropriate Bible for your child and read the stories. Let your child handle the Bible and encourage questions. You can explain that the Bible is where we learn God’s story, and how we are part of that story. If you let prayer be a part of your everyday life, not just something you do at church, your child will understand its importance. 6. Sit near an aisle or in a place where you can make an exit if needed. If your child needs to go to the bathroom, or is feeling overly stimulated or having a disruptive day, don’t be embarrassed. Walk your child out of the sanctuary until she can work off a little energy, and then come back in. This is much easier if you don’t have to crawl across a row of other people in the pew! 7. Be prepared with a worship notebook or bag. 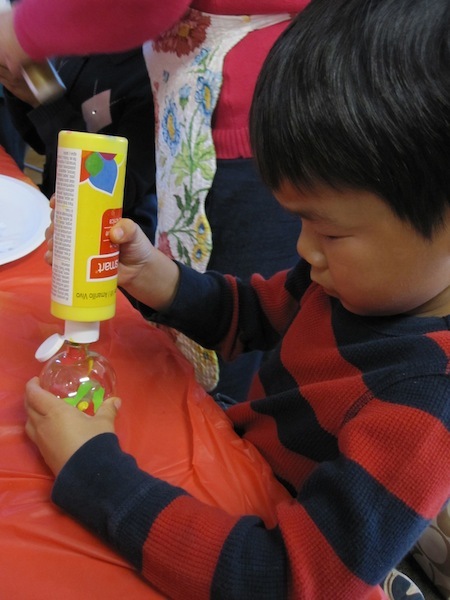 Many churches provide materials for children to use during worship, but if not, bring your own supplies. Colored pencils can be used to mark the parts of worship in the bulletin as you go through them one by one. Get to church a few minutes in advance and use a bookmark to mark the hymns that will be sung that day. Have some coloring pages from a Bible coloring book for your child to color, or some blank pages for doodling. 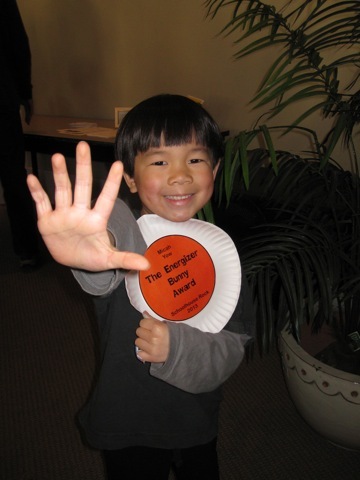 This is not disrespectful, and can help your child listen more attentively. Have the words of the Lord’s Prayer printed on a page for the child to follow, if he or she is of reading age. Let your child draw a picture of the anthem or hymns being sung, or the sermon, and give this to the choir director or pastor afterwards. 8. Teach basic church etiquette. 9. Get to know the pastor. Pastors of child-friendly churches love to get to know the children of the church. Introduce your child to the pastor after worship, and participate in other church activities so that the pastor becomes a friend and not a scary adult. It may take awhile for your child to become comfortable in worship, and to learn how to sit quietly. The best way for this to happen is to attend worship on a regular basis. There may be days when it doesn’t go well, but don’t let this stop you from coming the following week. Practice makes perfect! What were we doing from June 17-27, 2013? 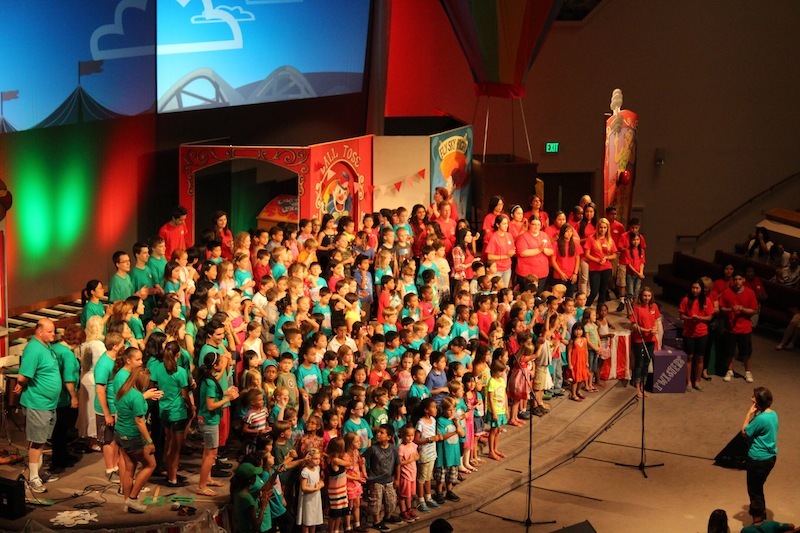 We were at Community Vacation Bible School in Castro Valley! 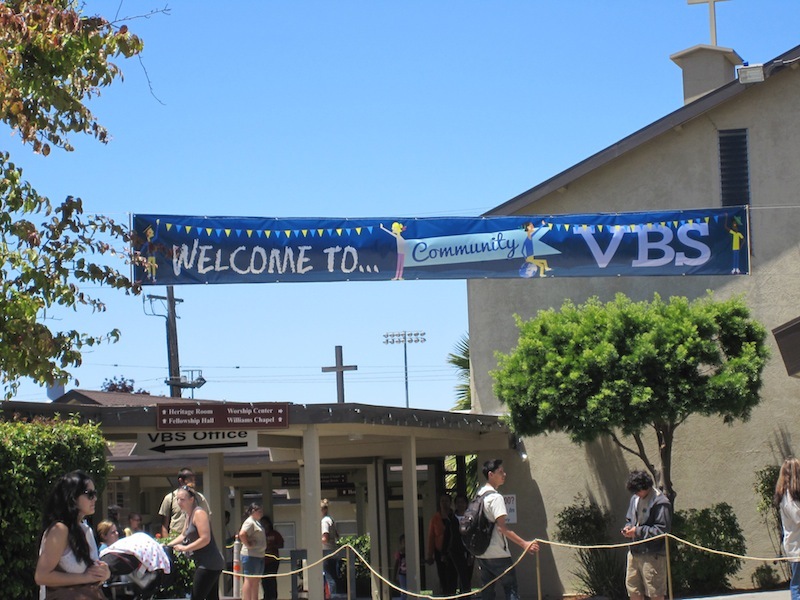 This was our third year attending Community VBS, which was sponsored by Redwood Chapel Community Church, Neighborhood Church, and Castro Valley First Baptist Church. I was part of the VBS Women’s Class (more on this later), Micah was at VBS at Redwood Chapel, and Bekah was lovingly cared for in the nursery at First Baptist. 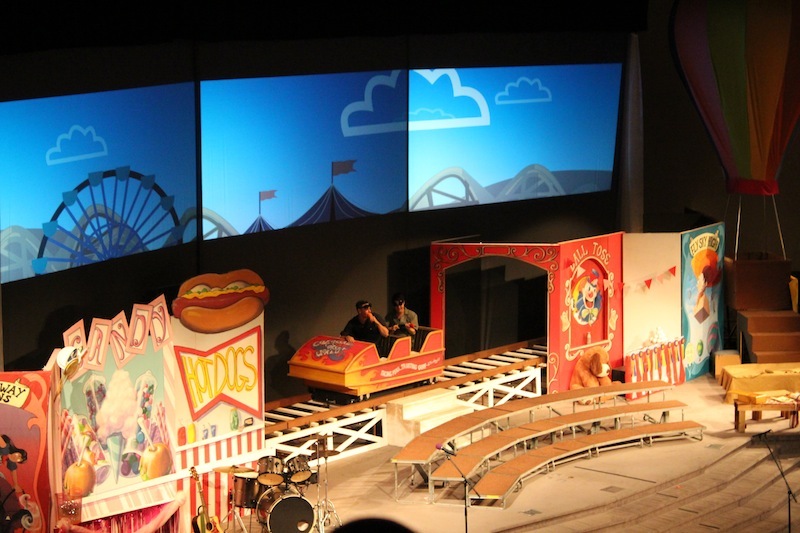 The theme for this year was “Colossal Coaster World” and the motto was “Facing Fears – Trusting God!” Isn’t that a great motto! 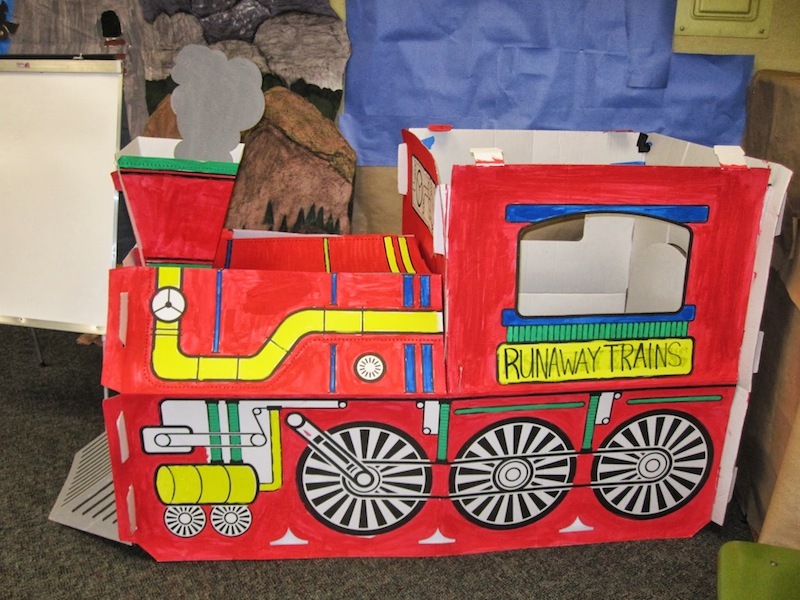 The Kindergartners were called the Runaway Trains. 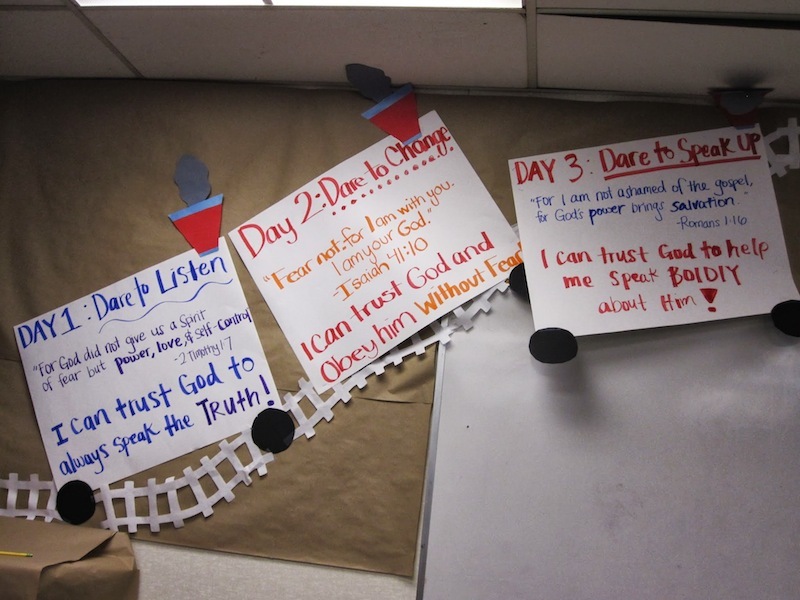 The bible lessons focused on the life of the Apostle Paul and each day there was a new bible verse for the kids to memorize. 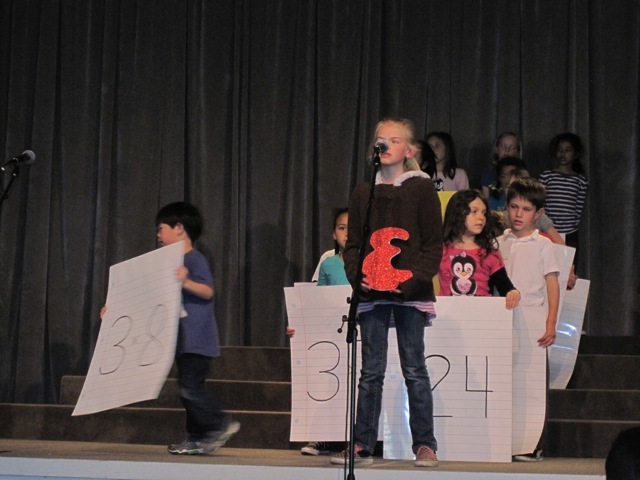 A children’s offering was taken in the classroom to help fund two missionary projects. The money was given to purchase cows or goats for a children’s home in Uganda and to purchase mosquito nets for missionaries in Africa. The kids also heard stories from two missionaries during story time. In 3.5 hours, they did all of this, plus a craft, recreation time, snack, and a rally. So many kids! Praise God! 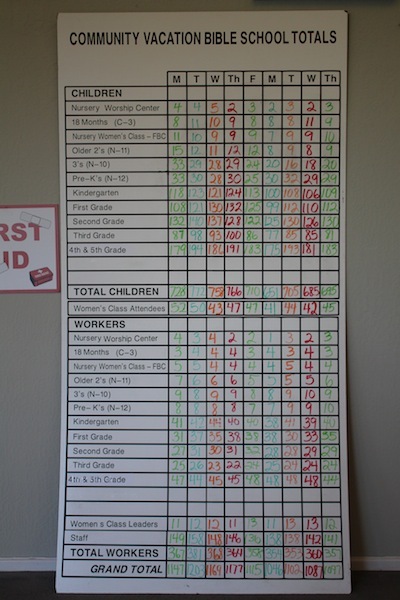 Totals for every person participating in VBS. Look at the Grand Totals at the bottom! I’m part of the Women’s Class Leaders count, Bekah is in the Nursery Women’s Class – FBC count and Micah is in the Kindergarten count. Over 1,000+ people each day! 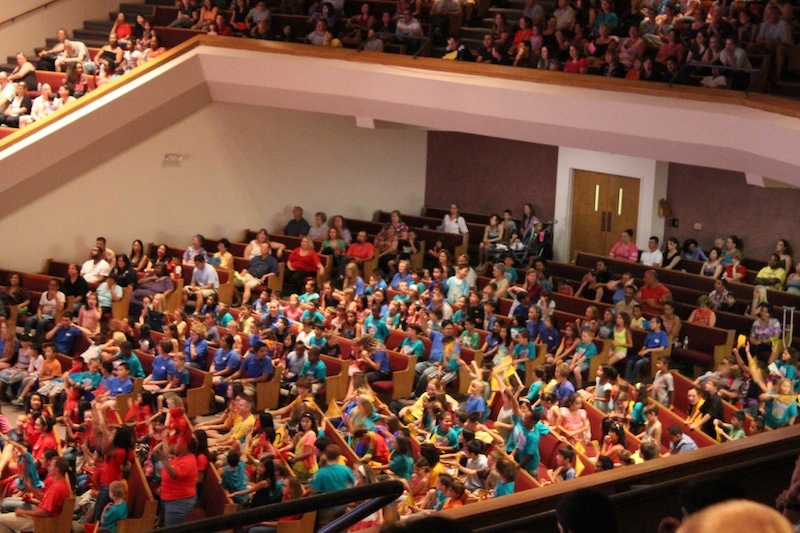 For more pictures from VBS, click HERE. October is a fun month! I think Halloween is Micah’s favorite holiday/time of the year. 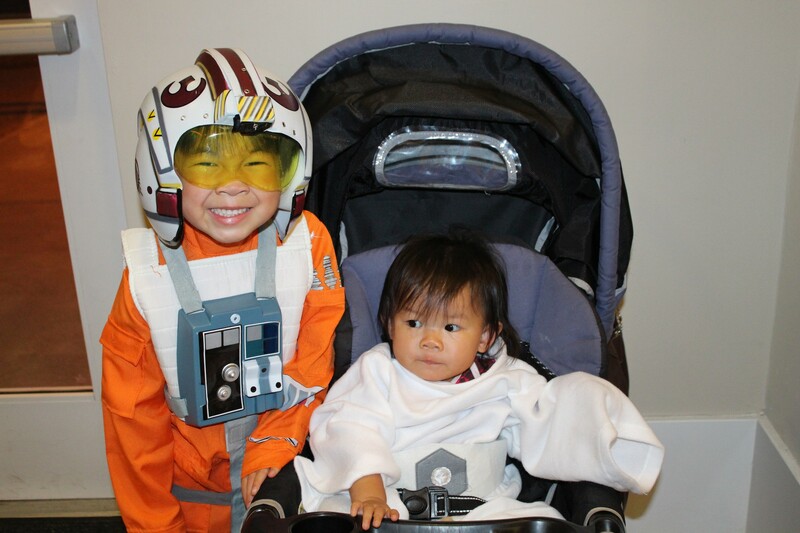 This kid loves pumpkins and pumpkin patches, costumes, festivals with games and prizes, and trick-or-treating. We don’t dress the kids up in scary costumes and most of our decorations are Fall related, but it’s a fun time and I find myself enjoying the season as well. 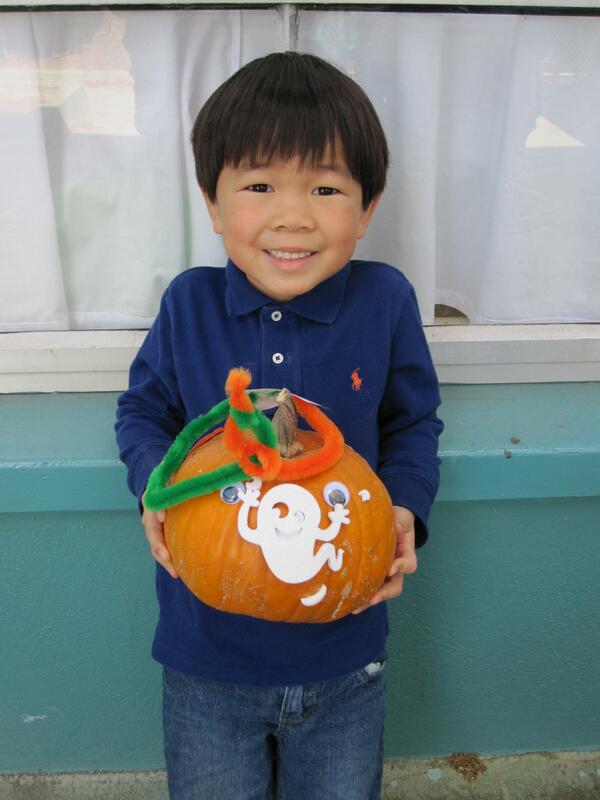 School Pumpkin Patch – Micah’s school set up a cute, little pumpkin patch for the Kindergarten classes last week. 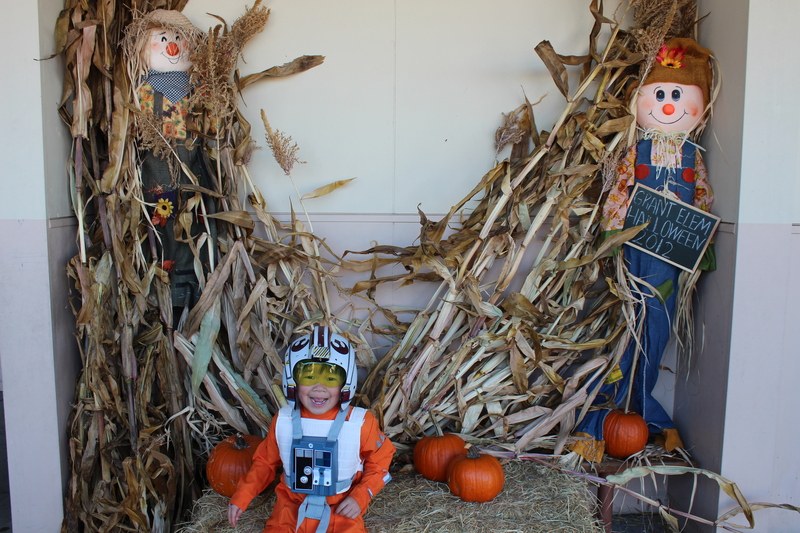 They had haystacks, cornstalks, a happy scarecrow and pumpkins. For $2.75, the kids got to choose their own pumpkin to decorate and take home. What a deal! And these weren’t little, itty-bitty pumpkins…they were pretty good-sized pumpkins. Here’s Micah with his pumpkin. He decorated it with a face and his buddy from class made a hat. 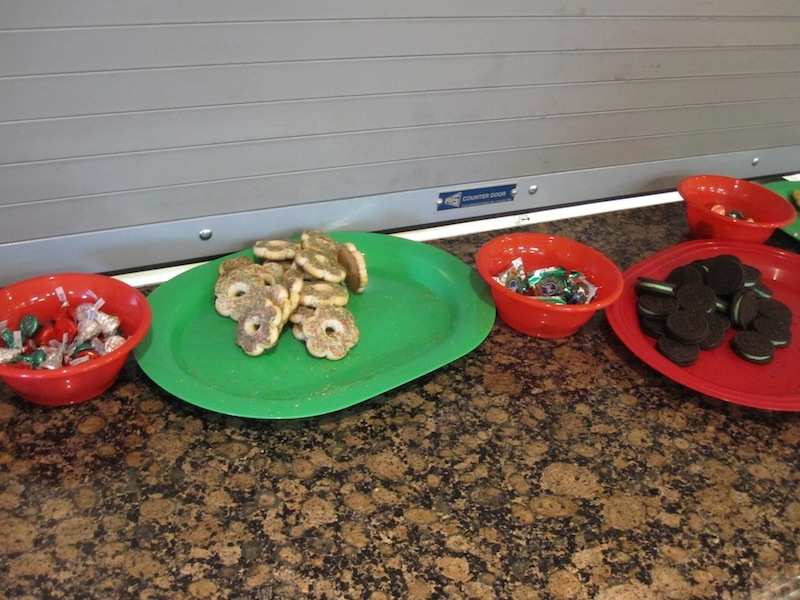 Creekside Candy Company – On Friday, our church had their annual “Candy Company” community carnival. 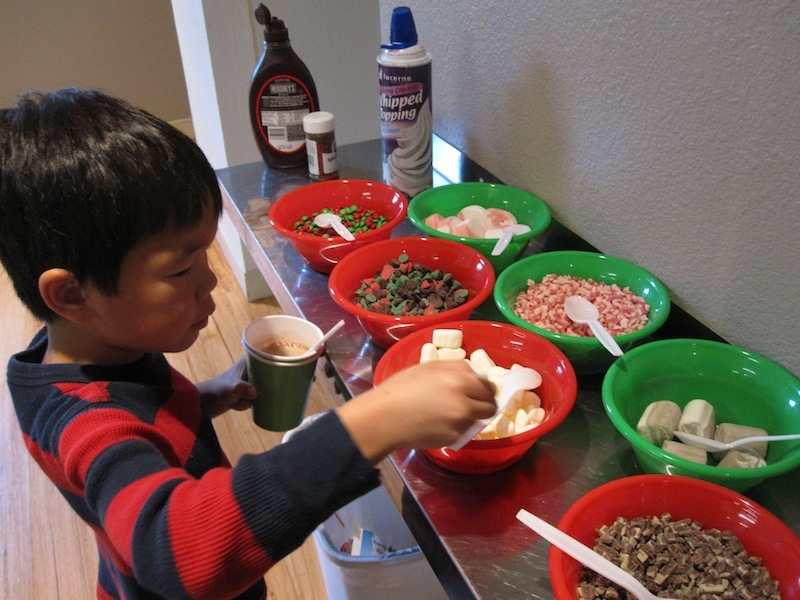 There were games and prizes, cookie decorating, tattoos, and a life-sized version of Candyland for the kids to play. More Candy Company photos here. School Fall Festival – On Saturday, we went to the Fall Festival at Micah’s school. There were games, snacks, a costume contest, crafts, plant your own fava bean, etc. 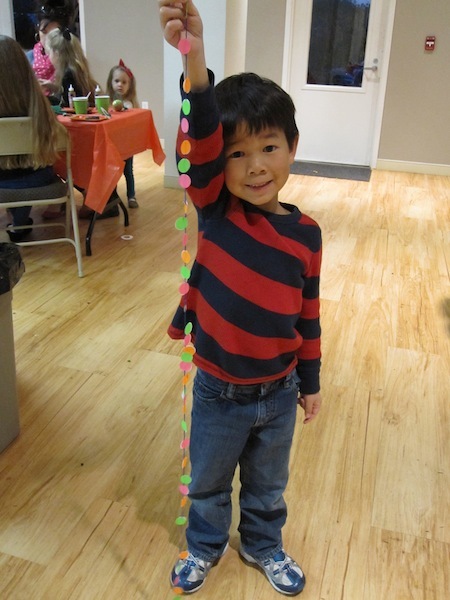 More Fall Festival photos. 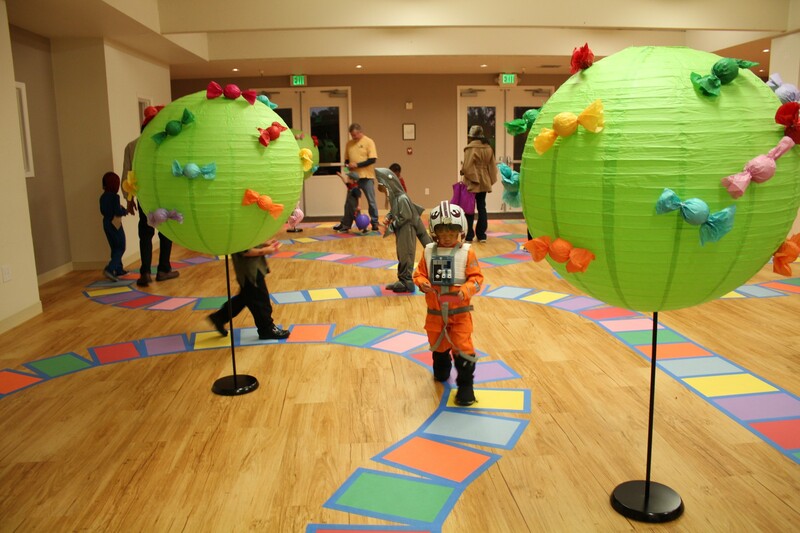 We have a few more Fall/Halloween related events coming up…Kindergarten parade and class parties, Trick-or-Treating at CV Village and Harvest Festival. Love East Bay is a semi-annual event where people, churches and organizations participate in a variety of community service projects, while sharing the love of Jesus Christ with their neighbors. 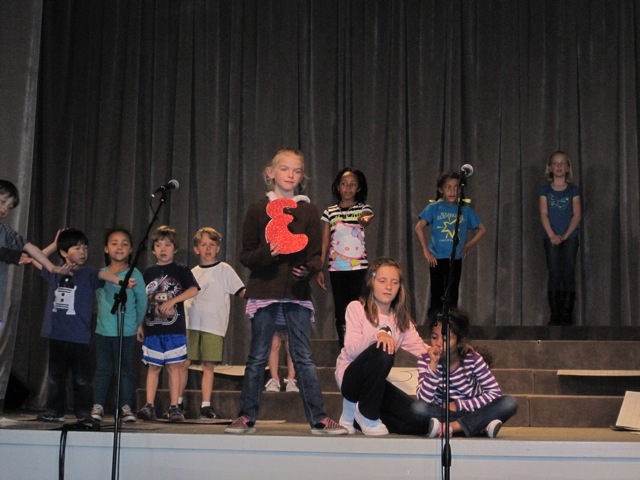 This year, Love East Bay was on October 20th and our family signed up to do a service project with our church. The project was called “Succulent Bridges.” There were also other projects at the church, like making fleece blankets, putting together shoe boxes for Operation Christmas Child, knitting hats, and building a house for a family in Mexico. We saw many volunteers in the church parking lot cutting wood, hammering and building the walls of the house. The pieces will be driven down to Mexico and the rest will be completed there. 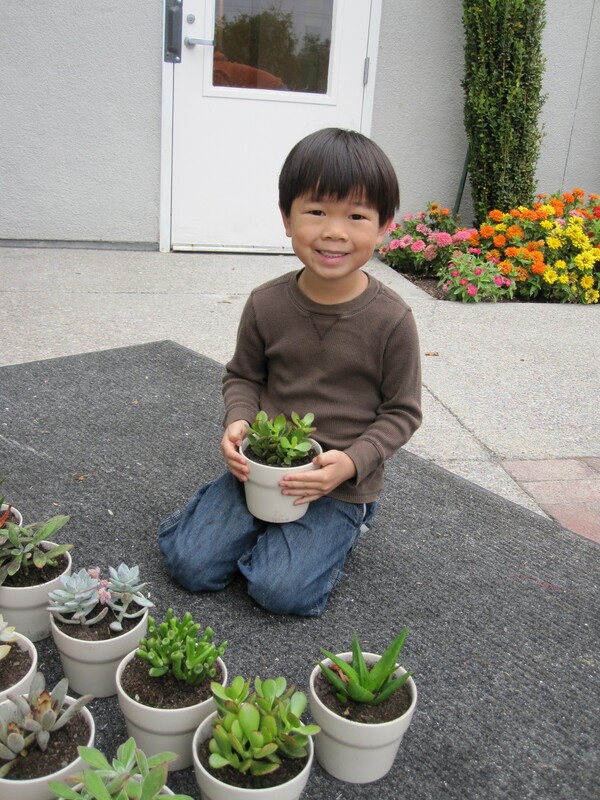 For “Succulent Bridges,” we decorated cards and potted some succulent plants. 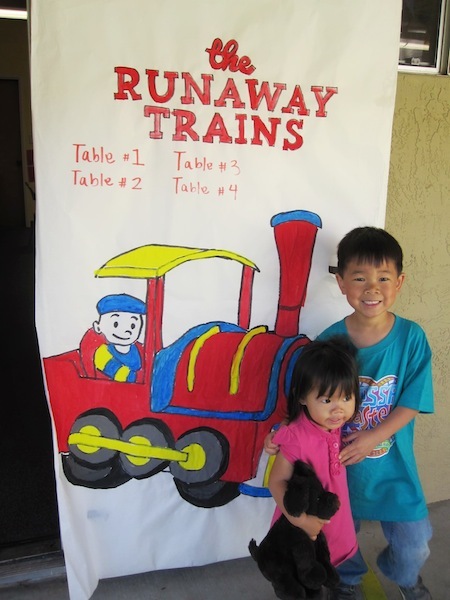 This was a great project for families with young children. Micah had a fun time coloring and putting stickers on each card and loved putting the succulents into new pots with some fresh soil. Then each family took about 4-5 plants/cards and with a map of the neighborhood, we went to designated homes to pass out our gifts. People who were home at the time were happy to receive the card/plant. If no one answered their door, we left their gift on the front porch. It was a fun and simple service project to show our neighbors some love and a wonderful learning experience for our kids.